You find out you are wrong, and you learn something. You find out you are right, and your own viewpoints are strengthened. You increase your critical analysis skills in the process of identifying the flaws in the speaker’s arguments. The fundamental problem with all those arguments — aside from being illogical — is that none of them outweigh the three benefits. College students aren’t mindless sheep waiting to be brainwashed by a Cult Wolf Leader. 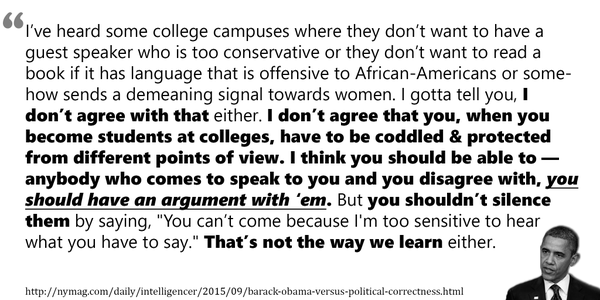 College students are taught how to recognize bad arguments, and to react & counter them with facts and objective reasoning. If a speaker’s viewpoint is indeed harmful, you aren’t legitimizing it or giving it a platform for spreading — again, that assumes students are helpless & mindless sheep. No, instead you’re actually preparing students for fighting it and for helping others fight back. College is the Shaolin Temple of Argument-Style Kung Fu. Don’t deny students the opportunity to hone their minds and their skills by disinviting speakers with disagreeable viewpoints.